Results of the Colorado Measures of Academic Progress or CMAS show Denver Public Schools students continue to outpace their classmates across Colorado in academic growth on the state English language arts and math exams in grades 3-8. In 2018, for the eighth year in a row, DPS students posted stronger academic growth than the rest of the state. The result of this sustained growth is that Denver students are now virtually on par with their Colorado classmates in meeting and exceeding grade-level expectations in literacy and math. Academic gaps between DPS students and their Colorado classmates have nearly closed: A 25-point literacy gap in 2005 between Denver and Colorado students has narrowed to a 3-point gap in 2018. And a 22-point gap in math skills in 2005 has narrowed to a 2-point gap this year. “In 2005, DPS was last among the state’s largest 12 districts in academic growth in English language arts and math,” said DPS Superintendent Tom Boasberg. “Through the focus of the Denver Plan and the incredibly hard work of our teachers, students and families, DPS has gone from last to first in academic growth. 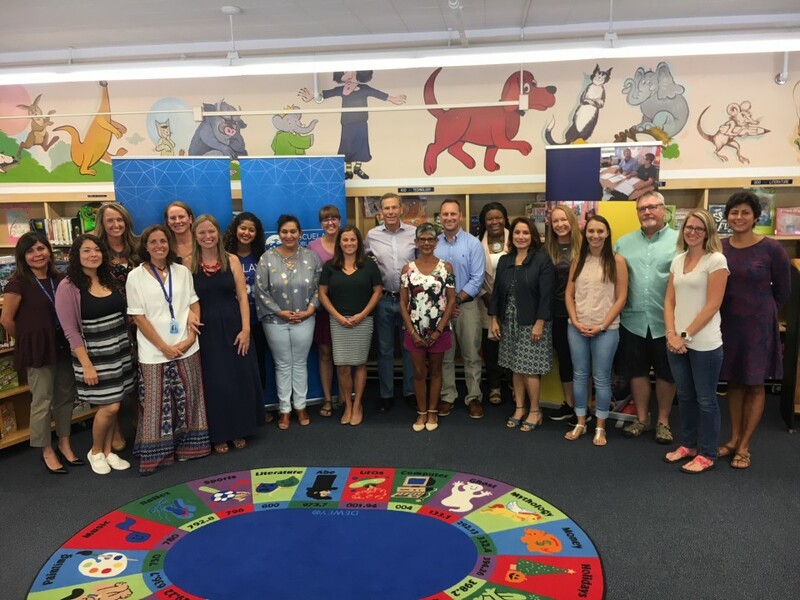 Board members Jennifer Bacon, Angela Cobian and Lisa Flores, Superintendent Tom Boasberg and DPS educators celebrated CMAS gains in Southwest Denver. Knapp Elementary serves 560 students in preschool through grade 5; more than 90% are eligible for the federal free and reduced-price lunch program, an indicator of poverty. Students at the school posted academic growth rates of 70 in English language arts and 74 in math, surpassing the state’s average growth rate of 50 in both subjects. Knapp was once ranked red, or the lowest possible rating, on the district’s School Performance Framework. But the school improved to green, or “Meets Expectations,” in 2008 and has maintained that higher rating. For the first time this spring, DPS students took the full slate of the state’s new high school exams, including the PSAT in grades 9 and 10 and the SAT in grade 11. As with CMAS, to provide an understanding of student progress, the state is calculating growth rates for PSAT/SAT tests. Boasberg described results of the new high school exams as disappointing. And while students from all DPS demographic groups have been making sustained academic progress –for example, students of color gained seven points in English language arts proficiency over the past three years and DPS English language learners now significantly outperform their peers statewide – gaps in performance persist. More information about DPS results on the 2018 CMAS/PSAT/SAT exams can be found here.